Ajaxian.com - Dion Almaer and Ben Galbraith. Ajax Matters - Shane Witbeck. Ajax Patterns - Michael Mahemoff. Ajax builds on older technologies and techniques but reaches a tipping point where the results are new. This book gives you a boost to this next stage of web application development, teaching you how tried-and-true web standards not only make Ajax possible, but why developing with them is faster, easier and cheaper. Learn to build browser-based applications that function like desktop programs. A Simpler Ajax Path - Matthew Eernisse. Accessibility of AJAX Application: Part 1 - Jared Smith. Ajax: 99 Percent Bad - Johnnie Manzari. Ajax, Ajax Everywhere - Derek Powazek. AJAX: A Fresh Look at Web Development - Edmon Begoli. AJAX: A New Approach to Web Applications - Jesse James Garrett. AJAX and Accessibility - Faruk Ates. AJAX and Accessibility by Peter Krantz. AJAX and Interface Design - Luke Wroblewski. Ajax Cleans Up Web Applications - David Utter. AJAX: How to Handle Bookmarks and Back Buttons - Brad Neuberg. Ajax in Action. Chapter 6: The User Experience - Dave Crane & Eric Pascarello with Darren James. Ajax Link Tracker - Glenn Jones. Ajax on Rails - Curt Hibbs. AJAX: Usable Interactivity with Remote Scripting - Cameron Adams. AJAX: Your Take - D. Keith Robinson. Call an Apple an Apple - Ian Hickson. Edit-in-Place with Ajax - Drew McLellan. Designing for the Subtlety of Ajax - Jeff Veen. Errors and AJAX - Joshua Gitlin. Easy Ajax with Prototype - Drew McLellan. Fixing the Back Button that AJAX Broke - Mike Davies. For Many AJAX is Not Degrading, But it Must - Thomas Vander Wal. How to Develop Web Applications with Ajax, Pt. 1 - Jonathan Fenocchi. Increasing the Strength of Ajax - Eric A. Meyer. Is AJAX Here to Stay? - Jordan Frank. Life After Ajax? - Micah Dubinko. 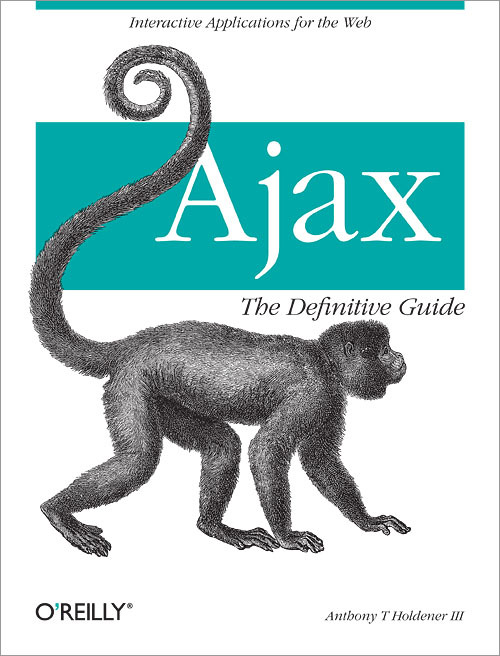 Proudly Presenting AJAX-S! - Robert Nyman. AJAX-S, Release 2! - Robert Nyman. Statistical AJAX - Steve Smith. Step by Step to AJAX - Jayaram Krishnaswamy. Take Command With AJAX - Stoyan Stefanov. This is Not Another XMLHttpRequest Article - Cameron Adams. Progressive enhancement using XmlHttpRequest - Jeremy Keith. Rasmus' 30 second AJAX Tutorial - Rasmus Lerdorf. Remote Scripting with AJAX, Part 1 - Cameron Adams. Remote Scripting with AJAX, Part 2 - Cameron Adams. The Hows and Whys of Degradable Ajax - Ryan Campbell. Using Ajax - Phil Ballard. Using the XML HTTP Request object - Jim Ley. Using the XMLHttpRequest Object and AJAX to Spy On You - Earle Castledine. Usability and accessibility with AJAX - Simon Willison. Very Dynamic Web Interfaces - Drew McLelland. Will AJAX help Google clean up? - Paul Festa. Why Ajax Isn't Web 2 - Anne Van Kesteren. Why Ajax Matters Now - Jesse James Garrett. XMLHttpRequest for The Masses - Drew McLellan. What are we doing well? What could we be doing better? Is there a feature you would like to see added to the site? Let us know. © 1997-2019 hyperacktive.com. All rights reserved. Not responsible for content on 'third-party' pages linked from this website.